The Bosch eBike system provides five different riding modes to choose from, offering the ideal support profile depending on the application and rider type. 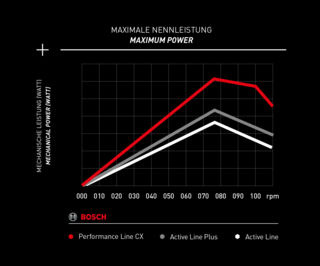 Direct, powerful support up to maximum cadence for sportive riding. Immediate, powerful support for athletic riding off-road and in city traffic. With the Performance Line CX, the eMTB mode replaces the Sport mode. Progressive support for a natural riding sensation and optimal control on demanding terrain. Steady support for long tours. Effective support at maximum efficiency for maximum range. Experience a relaxed and safe riding sensation with harmonious support from the quiet Active Line. It provides just the right support, up to 40 Nm, for relaxed riding enjoyment up to a maximum of 25 km/h. The pedal resistance is minimal even above this speed or when switched off. Weighing only 2.9 kg, the drive unit is the smallest, lightest and most elegant system in the Bosch eBike product family. Benefit from riding enjoyment and maximum comfort backpedal function. The Active Line is the drive for anyone who wants a light and elegant look. Experience gentle acceleration with a quiet drive. This makes it easier to integrate the drives into the frame and improves handling. 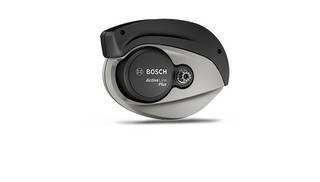 A lightweight, quiet Bosch motor provides even more riding enjoyment without annoying extraneous noises. Bosch sets new standards with flowing shapes and beautiful lines. The new Active Line has already won a Red Dot Design Award. The new Active Line drive unit is 25% smaller than before and, thanks to its compact size, allows improved integration within the bicycle frame. The intelligent three-sensor Drive Unit concept takes more than 1,000 measurements per second to ensure a gentle power characteristic. The innovative drive concept allows a very light drive unit, weighting only 2.9kg. A maximum torque of up to 40 Nm ensures gentle supporting acceleration. Moderate support for greater mobility in everyday use up to a maximum of 25 km/h. Optional available with a backpedal function. Look forward to new places and their stories – and enjoy the allure of the unknown. The especially quiet Active Line Plus eBike drive has been designed for little adventures like this. Without disturbing extraneous noises, you gently cross the 25 km/h boundary with minimal pedal resistance. Riders can enjoy powerful support of 50 Nm on voyages of discovery after work and on weekends. Three sensors that record your riding data more than 1,000 times per second are responsible for the harmonious riding sensation. This, combined with the lighter weight and reduced size, means the drive unit can be integrated perfectly into the bike frame so that you get even more enjoyment from eBiking. The versatile Active Line Plus is the ideal companion when you want to discover new places and expand your eBike excursions beyond the city boundaries. The quiet, small yet powerful drive unit is the best in its class and offers a significant plus in riding enjoyment, as well as improved handling due to its low weight and reduced size. The innovative drive concept allows a very light motor weight of only approx. 3.2 kg. 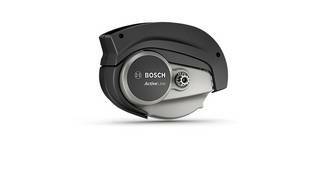 Bosch sets new standards with flowing shapes and beautiful lines. The new Active Line Plus has already won a Red Dot Design Award. The gear shift detection feature on the new Active Line Plus protects the components and ensures easy and smooth gearshifts. The quiet and reliable Bosch motor provides even more riding enjoyment. The gentle acceleration provides a natural riding sensation - with minimum pedal resistance at over 25 km/h. The intelligent three sensor Drive Unit concept takes more than 1,000 measurements per second to ensure a gentle power characteristic. A maximum torque of up to 50 Nm ensures agile acceleration. perfect for city trips or relaxed tours. The right amount of support for greater mobility in everyday use up to a maximum of 25 km/h. One step on the pedal and the power kicks in. Achieve a perfect symbiosis with your eBike. The judiciously delivered support provides even greater riding enjoyment in every situation and the Performance Line CX will not overheat, even during long ascents. Specially developed for sporty riding on mountainous terrain, eMTB mode raises eMountain biking on trails to a whole new level: it is no longer necessary to switch riding modes, giving riders optimum control and allowing them to focus on a thrilling riding experience. What more could you want? Perfect support as soon as you step onto the pedals. Moving off steep ascents is made significantly easier. For a natural riding sensation and optimum control. Depending on the pedal pressure, the progressive motor support automatically adapts to the individual riding style. No trigger: More riding enjoyment with eMTB mode without having to switch modes. There is no need to change support modes in eMTB mode, so the rider can concentrate fully on the trail. Improved control in difficult riding situations. Enables effortless riding and optimal traction on technical uphill sections and over obstacles. With a torque of up to 75 Nm. For sporty acceleration even in alpine terrain, without changing gear. enables powerful drive, fast sprints and a very sporty riding style. Support up to 25 km/hr. Does not overheat even on long mountain trips. BETTER POWER DELIVERY: Ensures maximum traction and control. SPORTY STARTING: Perfect start-up behaviour as soon as you step onto the pedals. IMPROVED DYNAMICS: Enables effortless riding on technical uphill trails or over obstacles. For a powerful start on steep uphill sections and on rough terrain: the eMTB mode replaces the previous ‘Sport’ mode in the Performance Line CX drive unit and switches between ‘Tour’ and ‘Turbo’ riding modes. With a maximum torque of up to 75 Nm, the motor dynamically supports the rider’s own pedal power by between 120 and 300 percent in eMTB mode, depending on the pressure applied to the pedals. Improved start-up behaviour guarantees optimal support in all terrains and on any trail. The dealer can upgrade the Performance Line CX at any time with the new eMTB mode or, if desired, load the classic Sport mode. In eMTB mode, the rider receives the required power – always precisely at the right moment. Enjoy smooth starts, cover ground more easily and arrive at your destination after an exhilarating riding sensation: that’s what the flow of the Performance Line CX is all about.